You can squeeze it, zest it, slice it, juice it, pickle it, or even take a bite out of it as Sicilians do. Adding freshness and flavor to food and drinks, this versatile sour fruit, also known for resolving diverse health and household troubles, has long been considered vital to Mediterranean and European cookery and cuisine. 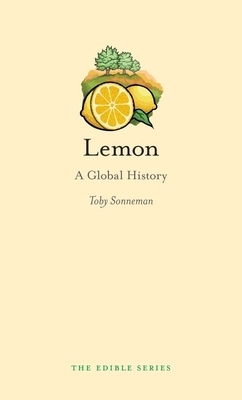 Lemon: A Global History tells the story of the remarkable adventure of the lemon, starting with its fragrant and mysterious ancestor, the citron, adored by the Greeks and Romans for its fine perfume and sacred to many of the world’s great religions. The lemon traveled with Arabs along ancient trade routes, came of age in Sicily and Italy, and sailed to the New World with Columbus. It was an exotic luxury in seventeenth-century Europe and later went on to save the lives of thousands of sailors in the British Royal Navy after being recognized as a cure for scurvy. The last century saw the lemon’s rise to commercial success in a California citrus empire as well as the discovery of new varieties. This book also includes delicious recipes for sweet and savory dishes and beverages. Toby Sonneman is the author of Fruit Fields in My Blood: Okie Migrants in the West and Shared Sorrows: A Gypsy Family Remembers the Holocaust. She is a native of Chicago and currently teaches journalism in the Pacific Northwest, with frequent travels to the lemon growing areas of California and Italy.